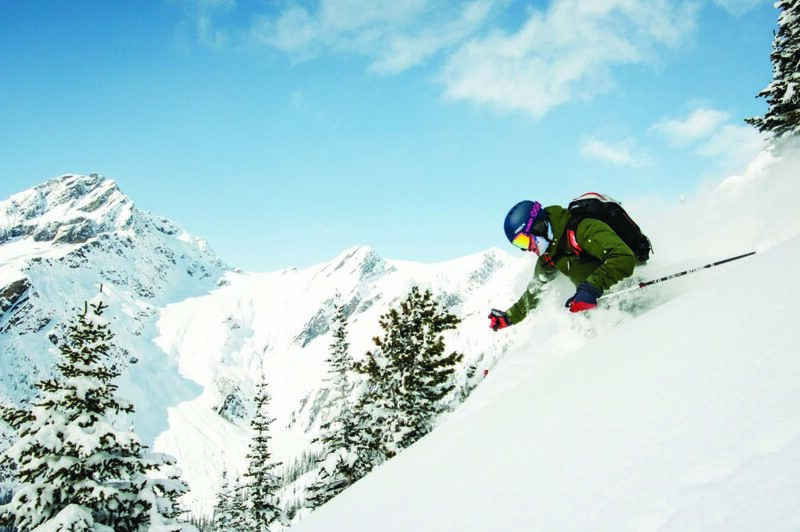 How one woman discovered that powder skiing at a remote lodge is an experience that’s enjoyable all by yourself—or shared. I’m riding on a pre-dawn bus, remembering my first solo ski trip to Canada. The first night I sat down to dinner with a group of strangers and they asked, “You’re here by yourself?” over and over as I met each of them. It wasn’t hard to tell the question was laced with skepticism. It seemed as though the general consensus was doubt that I’d be able to keep up and a shared interest in resuming conversation with any other human at the table that wasn’t, well, me—an unaccompanied female. Talk about third wheel, I felt unworthy and we hadn’t even donned skis yet. It’s the kind of vibe you pick up from someone who makes you want immediately prove them wrong and I left dinner feeling a need to justify my existence. It wasn’t exactly how I’d pictured the start of my dream heli-skiing. That all changed in a hurry: The snow that week was so deep we were rendered blind save for the apex of our turns, when heads would peek just above for a hot second. Somewhere between getting out of the heli and making my second turn of the trip, I had completely forgotten about the lukewarm welcome and just stated doing what you do when your day-to-day consists of being flown to the best skiing of your life. I lived in the moment, and had an absurd amount of fun. The chest-deep snow buried me in every turn. I had no time for anyone else’s boorish perceptions of me, just for powder. By the end of that trip something unexpected happened, however—I made seven new friends. It hadn’t seemed possible the first night but sharing the best turns of your life with other skiers bonds you quickly and we opened up to each other from there. As a lifelong introvert, walking away having made actual meaningful connections was incredibly empowering. The reward of winning them over when they so clearly doubted me from the start left me feeling confident for a long time to follow. Fast forward a handful of years and I find myself once again on a bus, and wondering if I’ve made a mistake. Almost everyone else is asleep, awkwardly splayed over semi-reclining seats. 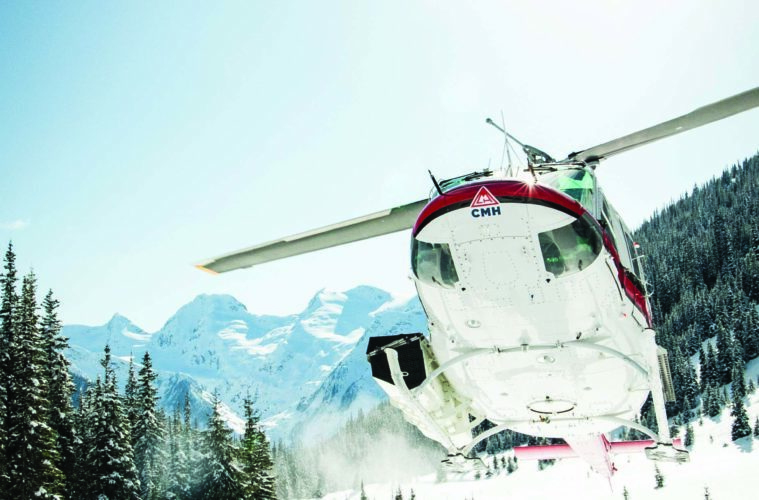 We’re headed to a heli pad where we’ll take a quick flight up to the CMH Cariboos Lodge, home base for a week of what we hope to be superb skiing. I can’t sleep, so I lay half curled on top of my pack, uncomfortable and pondering. My partner of three years—a diehard skier—sits a few rows back, snoring, unphased by the seats. What I realize, albeit too late, is that I might have made a mistake in making this trip a joint venture. Don’t get me wrong, I know we’ll have a blast. But as I reflect on my first solo ski trip and the many others that I made a constant in my winters to follow that followed, I realize these adventures have become an indispensable tool for self-discovery and for building confidence. I wonder if the combination of relationship and ski trip will stymie my growth, and, before we’ve even made one turn, vow to make my next trip a lone-wolfer no matter what. Halfway through this trip though, most of the lodge’s guests have already accumulated the vert they’d anticipated for the entire week, thanks to the all-time conditions that have graced us. We continue through a predictable cycle of ski pow, eat, sleep, repeat as we continue to rack up vert day after day. I also spend some time getting to know the other guests—a Swiss doctor, a hedge fund manager from Australia, a retired Intel executive, all of whom might otherwise be totally unrelatable. I have mediocre success. They don’t view me with skepticism of skiers on my first trip, but instead as simply a skier, like them, here not for what we are back in the world, but what we are after the heli drops us off out in the wild. They seem like nice, good people. But I find myself less interested in pushing to know them than spending time with the one person who already knows me and wants to spend time with me regardless of how I’m feeling. We head back out into the Cariboos on the following day. Thoughts of altogether abandoning my original plight for winning over would-be strangers make their way through my headspace as we scrape ice off our skis and click in. What difference does it make, I wonder, if I connect with them or not? The fact is I’ll probably never see them again. Still, I can’t totally let it go. It’s cold, but painfully beautiful as we ski through the trees. After the first pitch, my partner stops, so I stop, too. The sun peeksthrough the trees and snow crystals afloat in the air catch the light. The rest of the group has left.. It’s a moment I’m sure I’ll remember later, just the two of us surrounded by a quiet collection of trees in the middle-of-nowhere Canada. He looks at me and smiles, clearly appreciating what I am. And suddenly,rrrriiiiiipppppppppppppppppp! And his smile turns sly. For a half a second I freeze, totally caught off guard. “Ahhh!! Did you really just do that? !” I yell, laughing at the ridiculousness of him breaking the moment with a fart. So much for romanticism. He starts to ski away and looks over his shoulder, “I faaaarted!” he sings, and disappears through the trees. I can’t help but laugh out loud as I follow him and we shares the beauty of skiing deep snow together. In the end, I try to find a balance between spending time with my partner and attending to my own personal agenda. It worked, to an extent. I let go of expectations of how the experience would go and opened to the idea of a new kind of experience. The conditions were once-in-a-lifetime according to our 25-year-veteran guides, there was literally nothing left to do but get enough rest each night to fuel the tanks for another bell-to-bell day of skiing followed by après margs and small talk with the crew. Who was I kidding, anyway? It was always about the skiing. The Best of Breck Deep Winter Adventure Triple Your Winter The December Issue is LIVE!